David: Question: No matter how carefully I hand-nail shoe molding, it often splits. Can I do anything to prevent this? Norms Answer: It's always a good idea to drill a pilot hole before nailing trim with a hammer, especially if the wood is thin or the nail is close to the edge. But with this trick my father taught me, you won't need to go hunting for the right-size bit. Just use one of the nails. First, cut off the nailhead so that the drill's jaws can get a tight grip on the shaft . 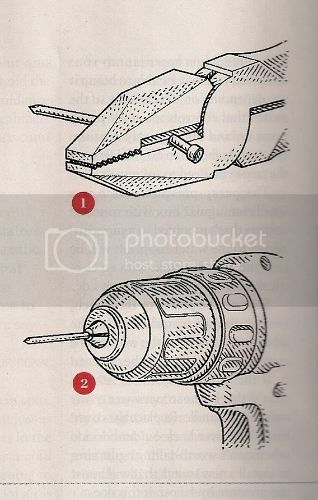 Then stick the cut end into the chuck, snug up the jaws , and drill away with the nail's factory-cut point. You'll get a perfectly sized pilot hole every time.